FX-2 Chiller OLED Control Display - Micro-Air, Inc. The FX-2 Chiller OLED Joystick Control Display connects to the FX-2 Control Board (ASY-360) and allows for the control of a single-stage chiller system. The FX-2 Control Family was designed to support either DX/CW cabin control or chiller system control, all with a common control board. When operating as a chiller control, the FX-2 provides all of the required features for safe and simple operation. 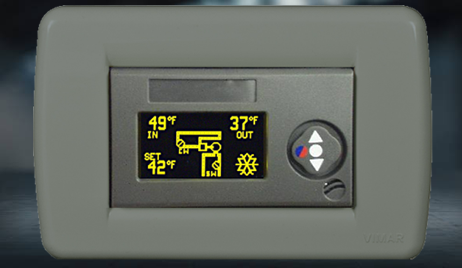 The FX-2 Chiller OLED Joystick Control Display can be mounted in either the Vimar® Idea or Gewiss® Playbus frames. Hundreds of decorative bezels are available for either line.